Recycle Utah’s education program gives kids the opportunity to envision the kind of world they would like to live in. This year, we talked to K-5th grade about the importance of earth’s resources, recycling, and most important, working together. We taught over 500 4th graders about water conservation at this year’s Water Festival. We hope to see our students, now well-informed in the environmental matters, teach the rest of the community. If you are interested in our education programs or would like for us to come to your school, please contact Mary Closser: mary@recycleutah.org. The Story of Stuff: Animated videos that explain the life of “stuff” before and after we use it, and how to use your consumer power to change the way stuff is made. Great lesson. Energy Quest: Puzzles, activities, games, and lessons on energy. Energy Kids: Understanding Wind Energy from the U.S. Energy Information Administration. Home Energy Conservation for Kids: Resources for kids to conserve energy in their homes. For questions about our environmental education programs or to schedule a field trip, class visit, or workshop, call us at 435-649-9698. Recycle Utah’s environmental educators join classes for activities and interactive discussions to teach essential environmental topics. Our educators visit classrooms across Summit County throughout the school year, including Treasure Mountain International School, Parley’s Park, McPolin, North Summit, and Weilenmann School of Discovery. All curriculum is designed to meet Utah Core Curriculum. View sample lessons here and here. 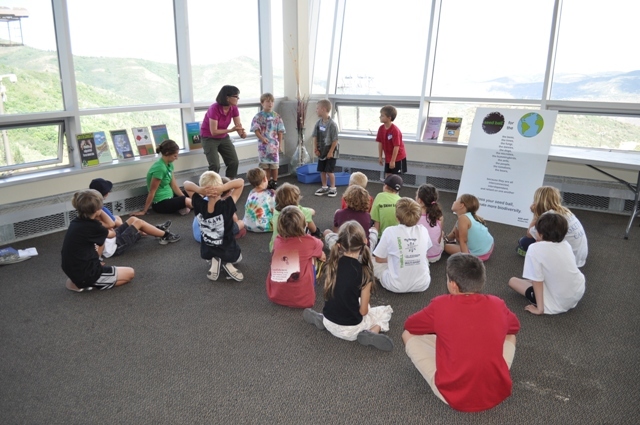 Recycle Utah Environmental Educators are available for Summer Camps! We’ll gladly meet up with summer camp groups to do fun activities and get them thinking about the world that’s blooming all around them. While we’re happy to go visit, we feel it is equally important that the kids get to see the recycling center and everything we do here. Generally, we ask that you come visit us first, and if there’s time, we can make a trip out to you. Pollution: Learn about any contamination of air, water or land that affects the balance of the environment. Seed Balls: Discuss the benefits of composting and native planting. Create wild flower seed balls with clay, water and egg cartons. Trees: Discuss why we appreciate trees and how we utilize them, while tying into recycling. Water: How does the water cycle work? Talk about water conservation and preservation. We mix clay with organic compost and native flower and grass seeds ahead of time. We talk about our arid mountain environment, water conservation, water-wise plants, and the importance of vegetation for wildlife and erosion. The kids roll small balls of the seed and clay mixture and store them in egg cartons to dry. Next time they get to go on a walk, hike, or bike ride, they can take the carton of seed balls with them and blast the countryside with native seeds. Wildflowers and grasses will grow in their wake, improving vegetation for wildlife, helping to control erosion, fixing carbon and nutrients into the soil, and adding even more beauty to Park City. Water-specific lesson plans teach students about water conservation, pollution, and soil structure. Visit Recycle Utah’s Recycling Center. Seeing recycling in action helps students understand the importance of resource recovery. All field trips get a tour of the center, seeing first-hand the more than 50 items we accept and how we deal with the sheer volume of stuff that we collect every day. You’ll get a behind-the-scenes look at the center and have a chance to ask questions about what happens to your recycling after you drop it off and the resources we are trying to conserve. Tours of the center last about 30 minutes, on average. Classes are encouraged to do a playground or park clean-up before hand and sort the garbage from the recyclables, then bring the recyclables to sort at the center after your tour. An older group of kids with more time (1 hr+) can help us sort large bags of aluminum cans. It’s a great hands-on way to learn about contamination and the value of proper sorting. This activity is best for small groups. We welcome classes, scout troops, and other groups. Call us at 435-649-9698 to schedule a field trip.